All in all, I’m well pleased with the improved functionality the redesign offers, the increased flexibility the SQL provides, the more subdued color scheme (plus it’s green – I love green even more than autumn leaves) and the fluid layout. I’m not 100% on a few things – the box at the bottom of the center column, for one thing. I feel like something should be there, but I’m not sure what yet. Same goes for the blog excerpt. I want to put something there (besides more ads, although of course I could) but I’m still iffy on what belongs. I would value feedback, opinions and ideas from anyone – whether you like what I’ve done with the place or not – because totally redoing the all of the pages on the site is going to be a long and involved process and I want to make it the best I can. 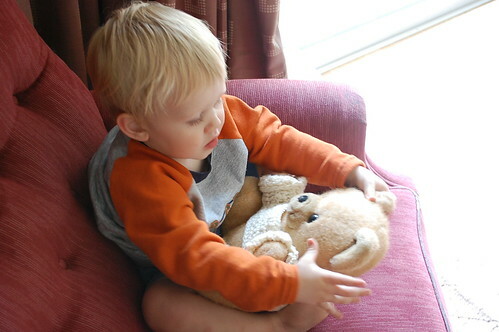 The boys were digging around in a bucket of stuffed animals today and pulled out my old teddy bear! 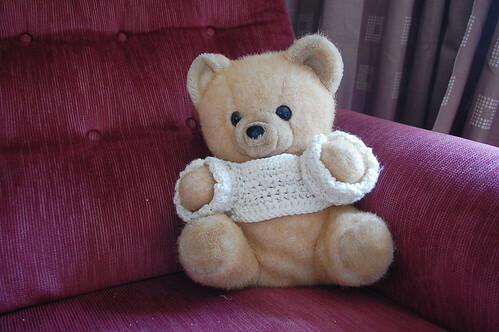 I remember when I was a child (I’m not sure how old), I realized that I didn’t have any stuffed animals. For some reason this disturbed me, and I raised the issue with my parents. They bought me this bear in response. When I went to college, I decided he needed a sweater, and realized he had no name! I named him Sam (for the LotR character) and I made him his sweater. Since I’ve been married he’s gotten stuffed in with the kids’ toys and buried, but I thought I’d document him while he’s up for air. Who knows? He may stay out a while. Charlie really seemed to like him. This entry was posted in Finished, Life in General, Other Projects.